Some books are like security blankets. You don’t really need them, but you want them. They make you feel good. They make the world less scary. They are nice to curl up with on a lonely night when life is against you. TAKE JOY is just such a soft and cozy book. The chapters are short with tiny, gentle lessons on craft–things like how to write a good first line and how to write with honest emotion. In between lessons on craft are even shorter chapters Yolen calls “interludes.” These funny snippets are apt observations about the writing life. Yolen discusses things like the gap between dream and reality, families nibbling away a writer’s precious time, and why rejection letters don’t mean anything. Yolen’s topics are well-worn and cover things that most of us already know. TAKE JOY didn’t teach me new things about the craft of writing, but it inspired me. Yolen reminded me why I love writing so much. She made me feel lucky that I get to do this incredible thing. She showed me ways to look at my writing–and myself–that just plain feel good. It’s a refreshing antidote to those “writing is so hard!” complaints I’ve been reading in blogs and books. Sure, writing can be challenging, especially if one wants to do it well. But it’s a fun challenge, one that most writers embrace with excitement and yes, joy. TAKE JOY is going on my keeper shelf. If the writing world ever starts to feel cold and harsh, I’ll know exactly which book to take with me as I snuggle under the covers. I always liked Jane Yolen. Will have to look for this one. It sounds truly inspirational. Thanks. I hope you enjoy the book as much as I did. It’s like a wubbie for writers. I love Jane Yolen’s work, but my absolute favorite of hers is a short-story called “Become a Warrior.” I will definitely be investigating this book. Jane Yolen does so many things right, doesn’t she? I admire her a lot. I hope you enjoy this book! Is is silly of me to mention that the cover alone is enough to make me feel joyful? 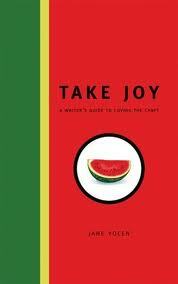 Next time I’m in one of my writing downturns (you know, the “I can’t do this!” mode of writing), I will get a copy of TAKE JOY. Thanks for letting us know about it! Thank you! It’s good to be blogging again after a month off. What a great book to blog about! I think, sometimes,we underestimate the importance of inspiration/motivation in writing. But the Nike School of Craft (i.e. “Just do it”) doesn’t work for everyone. Some of us need a *reason* to plug away day after day, and it looks like Yolen’s security blanket provides it! Thanks for stopping by the blog, Ilana! Most craft books I read once or twice, learn the lessons, and move on. But the inspirational books on my shelves are the ones I turn to again and again.